This is the second post in the Back to “Home” School series. 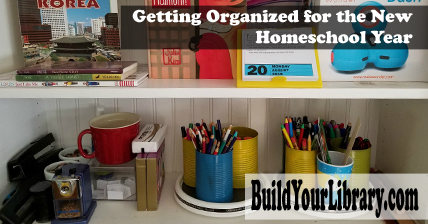 Yesterday I gave some advice to new homeschooling mothers, and today, we’ll be discussing how to get organized. So you bought your curriculum and you went school supply shopping… Now what? 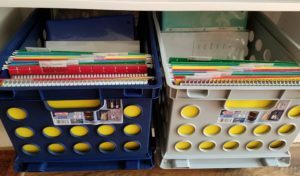 If you are like most homeschooling parents, you are hoping to find a way to keep your materials both organized and accessible. I’m not claiming to be any sort of organizing guru, but I like to think I have at least managed to keep our homeschool materials in order. Today I’m going to share some tips to help you stay organized all year! I am always working on creating and perfecting a system that works for us. I’ve long thought that workboxes looked like the perfect way to keep our daily work organized, but until recently, I never had the space to make it work. Now that I have my bookshelves, I was able to put something together that I believe will work for everyone. My youngest has six drawers in which I will put her daily assignments. Each drawer will be a subject and when she’s completed each drawer, she is done for the day. 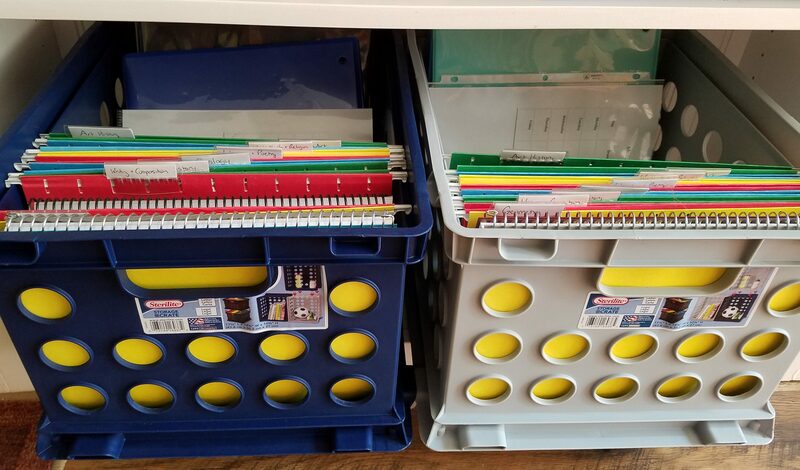 My twins will have a similar system, though to save space I am using crates with file folders. Each folder is essentially a “box” with an assignment to complete. One thing I am always asked is how to organize all of the papers that go with Build Your Library’s curriculum. We keep our work in binders. As they complete their daily assignments, they file them behind the appropriate tabs in their binders. The twins have 3 binders – a history/language arts binder, a science binder, and a Book of Centuries timeline binder. I keep all of our books that we’re studying for the year on their own shelves, so that everything is easily accessible. Each year’s worth of books (or month if we’re doing a unit study) is on one or two shelves for easy access. There is nothing more stressful than trying to hunt for a book you need the night before you need it! On another shelf in our dining room is where I keep the bulk of our school supplies. I have two lazy-susans where we keep things like pens, pencils, color pencils, glue sticks, etc. in recycled cans. Beneath that (not shown) is where I keep a third 3-drawer-bin for drawing paper, lined paper, and other paper odds and ends. Lastly, I have my two composition notebooks that will serve as my lesson-planners. This is where I write down our daily assignments, make notes about when we need to borrow materials from the library (as well as when things must be returned), or note special materials I need to pick up from the store to complete science experiments or art projects. I write their daily checklists in pencil, then the night before I’ll set up their assignments in their “workboxes” for the following day. And that’s how I keep our little homeschool running. 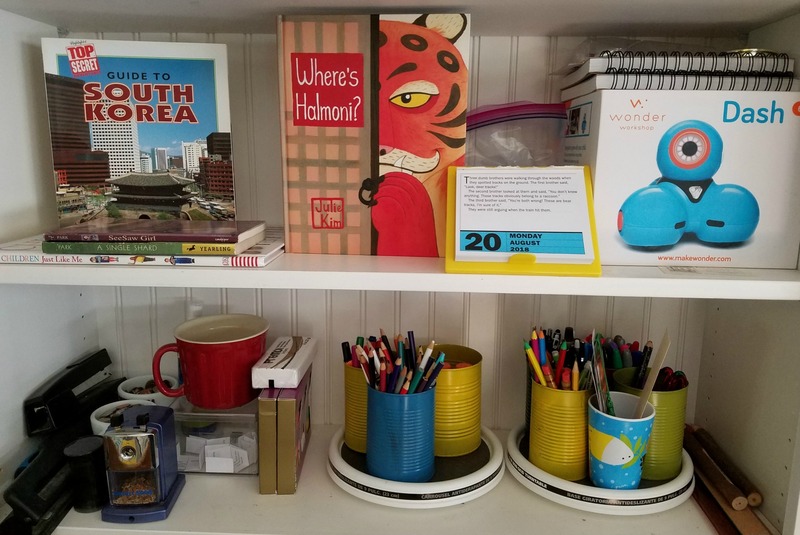 There are numerous pictures on Pinterest and other websites with gorgeous school rooms and a thousand different ways to organize every single thing. But do what makes the most sense for you and your children, high style or high function. Just because an idea works well for someone else, it doesn’t necessarily mean it will fit into your household, or that it will work for you every single year. 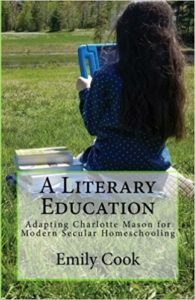 What are some of your best homeschool organization tips? I’d love for you to share any tidbits on what works for you in the comments below!